The Vatican Advanced Technology Telescope (VATT) is located on Mt. Graham in south eastern Arizona, and is part of the Mount Graham International Observatory. 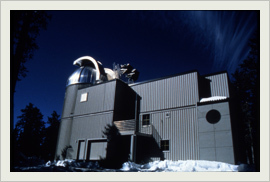 The Vatican Observatory Research Group (VORG) operates the 1.8m Alice P. Lennon Telescope with its Thomas J. Bannan Astrophysics Facility, known together as the Vatican Advanced Technology Telescope. Both observing time and responsibility for VATT are shared with the University of Arizona on a 75% VORG, 25 % Arizona basis. Below are links to the optical and instrument specifications to assist observers. The weather forecast at the VATT is provided by the National Weather Service.